With approx. 1,250 exhibitors, over 200 club presentations and around 20 official booths of international automobile manufacturers, Techno-Classica Essen again made the Ruhr metropolis the capital of the classic vehicle universe on its 30th birthday. The protagonists on the international classic vehicle and automobile scene congregated here: enthusiasts who, with heart and soul, ensure the preservation of automobile cultural heritage. In the redesigned fair halls in Essen, they presented the entire spectrum of the classic vehicle world to the over 190,000 visitors from 46 nations. The guests were able to admire over 2,700 connoisseurs' and collectors' vehicles offered for sale there - and to acquire them directly on the spot. The gigantic range available in the twelve fair halls with the Grugahalle and the four outdoor sites included the appropriate classic vehicle for every taste and wallet - from the affordable youngtimer of the ilk of an Opel Kadett from 1992 for just a few thousand Euros right up to Ferraris in the double-figure million Euro range. Thus, Techno-Classica Essen once more did justice to its claim to be regarded as "The Global Fair for Vintage Vehicles, Classic & Prestige Automobiles, Motorsports, Motorcycles, Spare Parts and Restoration and the World Club Meeting Place": For the exhibitors from more than 30 nations, it was a guarantor for good transactions in the anniversary year too - that applied not only to the vehicle trade but also to the other exhibition areas such as art, automobilia, model cars and literature. The large number of "Sold" signs on the vehicles in all price classes showed that, with Techno-Classica, the time for waiting had come to an end: Although the classic vehicle market tended to be regarded as difficult in the last two years, the global fair obviously stimulated the worldwide desire to buy vehicles. By the Saturday of the fair, Nick Aaldering, Managing Director of the Dutch trade professional "Gallery Aaldering", had already sold nine precious vehicles in the six-figure Euro range from his 30 vintage vehicles on offer - from the Aston Martin DB 4 right up to the Maserati 3500 GT Spider. "The buyers have become more critical. However, anybody offering their automobiles at realistic prices will quickly find purchasers," Aaldering analysed the situation. Martin Stromberg, Managing Director of Classic Data from Bochum, the oldest and market-leading company for the valuation of classic vehicles in Germany, confirmed the estimation: "After a hype in the past years, the classic vehicle market has, since the end of 2017, begun to calm down and become more predictable again - it has consolidated on a high level." Internationally renowned dealers such as Eberhard Thiesen from Hamburg, Gerhard Wolf, Managing Director of "Auto Toy Store" in Starnberg, or Anton van Dyke, Director of "Classic Park" in the Netherlands, reported good sales results. For Jonathan Kaiser, Director of Sports Classics London, Geneva, Kuwait, Abu Dhabi, his company's appearance was a successful premiere at Techno-Classica: The experienced vintage vehicle dealer presented six valuable classic vehicles from Aston Martin. The jury which was selected by the organiser S.I.H.A. and comprised international experts and journalists promptly chose a perfectly restored Aston Martin DB 5 Convertible from his range on offer as the "Best of Show". RM Sotheby's caused a sensation: In addition to the traditional Coys auction, the world's leading auction house for classic vehicles staged an auction of vintage vehicles and youngtimers in Germany for the first time. 86 percent of the 229 offered collectors' automobiles found new owners during the two-day auction. The total turnover of Euro 18.7 million was just as impressive as the price of Euro 2.25 million for the most expensive vehicle, a Mercedes-Benz 540 K Cabriolet A from 1937. What significance the automobile manufacturers attach to Techno-Classica was illustrated by no fewer than three major makes with premieres of innovations at the classic vehicle fair: Volvo showed the new S60 premium saloon to the German public for the first time - in addition to a selection of historic saloons from 90 years of Volvo history. As a German premiere, Alfa Romeo unveiled an Alfa Romeo Giulia Quadrifoglio Racing in Formula 1 team colours - one of a batch limited to ten vehicles. Jaguar Land Rover Classics even gave a European premiere: For the first time on the continent, the Britons showed the Jaguar E-Type Zero with an electric drive, based on a classic Jaguar E-Type from the 1960s. For example, Mercedes-Benz Classic surprised the visitors with an exhibition encompassing six of the C 111 research and record vehicles - an as yet unique parade. There was a small sensation here too: An unrestored Mercedes-Benz 300 SL which had been found in a barn and came from the range offered by Mercedes-Benz All Time Stars was immediately sold straight off the booth. Sascha Oliver Neumann, Spokesman of Volkswagen Classic, commented on the appearance of the people from Wolfsburg in a nutshell: "As the largest automobile manufacturer in the world, Volkswagen is presenting its history under the motto 'The World of Classic Volkswagen Vehicles' - The global fair Techno-Classica is the place predestined for this." As is tradition, the main attractions at the global fair for classic vehicles included not only presentations from the trade and the industry but also the appearances of international classic vehicle clubs: In 2019, around 200 vintage vehicle and make clubs presented themselves and their services on booths which had fascinating designs in most cases - often with scenes from car history reconstructed in a way ready for the stage. With a particularly great deal of lifeblood, the Dortmund Vintage Vehicle Friends designed their booth as a port tavern called "The Last Resort" - For this, they walked off with the trophy for the best club booth at the fair. For the first time, the Porsche Club of America encompassing 160,000 members also presented itself at Techno-Classica - another indication of the internationality of the premier classic vehicle fair especially because a lot of US club members harbour the wish to visit Techno-Classica Essen. However, the global fair for classic vehicles is more than just an infotainment show for the clubs. 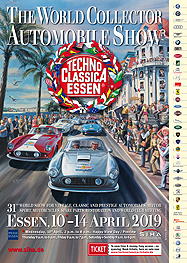 On this subject, Peter Schneider, Chairman of the Federal Vintage Vehicle and Youngtimer Association (DEUVET), said: "For us as the body representing the interests of the entire German classic vehicle scene in politics, Techno-Classica is the most important meeting place of the year: Here, we can coordinate our planned political activities with decision takers from the classic vehicle scene." In addition to DEUVET, other associations representing interests relating to classic vehicles also use Techno-Classica as a podium for their presentations - for example, they include the world vintage vehicle association (FIVA) and its official German representative (ADAC). Collectors' and connoisseurs' vehicles, model cars, art, car literature with new book presentations and autograph sessions, classic vehicle services, spare parts or also information about upcoming vintage vehicle events - At the global fair for classic vehicles, there is nothing that does not exist. 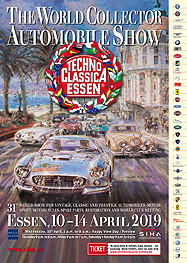 Therefore, enthusiasts are already looking forward to the 32nd edition of Techno-Classica Essen: It will take place from March 25 to 29, 2020.